She’s a woman with a past ruined with hard living and bad choices. She can’t remember the last time she could walk down the street free from the weight of shame. When was the last time life was good and hope seemed real? When did she become desperate for forgiveness? Hanging her head, she tries to slip by unseen. Women stand outside houses chattering about their children as the hot sun beats down. She feels even more alone. She walks faster as the women notice her. She’d run if she could, just to avoid the pain of facing what she’s become. She is notorious, a wicked sinner—probably the worst in town. Fingers point as pleasant talk turns harsh with snide comments. Over the sound of the breeze, she can hear the condemning gossipers listing off her latest sins. They’re not saying anything worse than she says to herself. How can she find forgiveness to start over, when she can’t even forgive herself? If hopeless was an ocean, she’d be drowning. Her heart stops for a moment as a tiny spark of hope flickers. Could he? Would he? Forgive her? Sometime later, Jesus reclines at the table having dinner with Simon, a respected religious leader. Bold with desperation, this woman acts with courage born of one last hope to turn a wreck of a life around. She is nameless, known only by a label: sinner. Some might say she is grasping for the wind by daring to enter Simon’s house. Uninvited, she weeps loud and hard, as broken-hearted women mourn their dead. The pain and bitterness of knowing exactly what she is can no longer be contained in the presence of the One who heals the sick and forgives the sinner. Tears won’t stop as she begins to wash His feet. She doesn’t dare to look up. With shaking hands, she wipes His feet with her hair. She pours out the only thing of value she has left, a small vial of perfume. It is the last bit of the life she dreamed of long ago. “Now when the Pharisee who had invited Him saw this, he said to himself, ‘If this man were a prophet He would know who and what sort of person this woman is who is touching Him, that she is a sinner’” (Luke 7:39). Pride makes it hard to love God. The weeping sinner stands stark against the judgmental pride of the religious man. Simon, confident in his position as a Jewish leader, looks on with disdain that follows self-importance. Worlds apart, Simon has done all the right things and this woman has thrown her life away with notorious sins. Past and position couldn’t be farther apart between Simon and the woman, but Jesus reveals the greatest difference is the condition of their hearts. Criticism comes easy. Simon cannot see this woman as a humble sinner, desperate for forgiveness and undone with devotion for Christ. With distorted vision, Simon sees himself as the one in the right. Telling a simple story, Jesus reveals Simon’s faults, uncovering the cracks in the façade of self-righteousness. “‘A moneylender had two debtors: one owed five hundred denarii, and the other fifty. When they were unable to repay, he graciously forgave them both. So which of them will love him more?’ Simon answered and said, ‘I suppose the one whom he forgave more.’ And He said to him, ‘You have judged correctly’” (Luke 7:41-43). In reality, they are both sinners, but the woman knows her sin and seeks forgiveness. Simon, confident in his own righteousness, has nothing but criticism for both Christ and the woman. In this moment, the tables have turned, and Simon is the sinner. Rather than condemning the woman, Jesus points out Simon’s lack of common courtesy. Simon neglects to welcome his guest with a kiss, a glaring oversight compared to the woman’s emotional act of devotion. The woman washes His feet with the intimacy of raw emotion. Love and gratitude turn a servant’s chore into an act of worship. She has no concern with what the others think of her actions. All she can see is an opportunity to show love and gratitude at the mere chance of forgiveness. This woman knows her sin, desperately desires to be forgiven, and loves Christ deeply. When you are desperate to be forgiven. Reject the lie that what you have done cannot be forgiven. Perhaps you feel there is no hope for real forgiveness and change. You’ve gone too far for too long, and you’re drowning in a sea of hopelessness. Maybe you’ve done things you never thought you’d do and you cannot forgive yourself. “How can God possibly forgive me for…,” is a constant thought that tortures your soul. My Friend, be encouraged by the boldness of this nameless woman. Prayerfully put yourself in her place. Pour out your heart to Christ and believe that you will be forgiven just like this brave, broken woman weeping at the feet of Jesus. Believe Jesus has the authority to forgive every sin, including yours. Today, choose faith over self-condemnation. Ask for forgiveness and listen to Him say to you, “Your sins have been forgiven…. Your faith has saved you; go in peace” (Luke 7:48, 50). 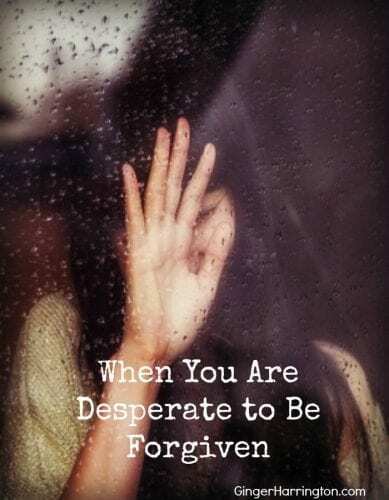 Won’t you share this post with anyone who needs to find peace when they are desperate to be forgiven? I’m honored this post has been featured at Grace and Truth. Joining in with these blogging communities: #RaRaLinkUP, Coffee for Your Heart, #ThreeWordWednesday, #TellHisStory, and Grace and Truth. Forgive yourself, forgiveness, love God, Luke 7, PEACE, pride, Seeking God. Bookmark. Ginger, I love how you’ve retold this story in a way that we can relate to today. This offers so much hope, to me, to the hurting, to the lost! 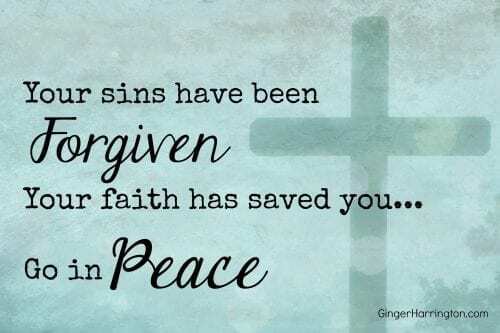 Thank you for sharing the good news of Christ: forgiveness for all who will seek it. So glad you are here, Marva. You spread joy everywhere you go, and I love that about you. I’m so glad our paths have crossed. I am often blessed when I visit you here and this time is no different. 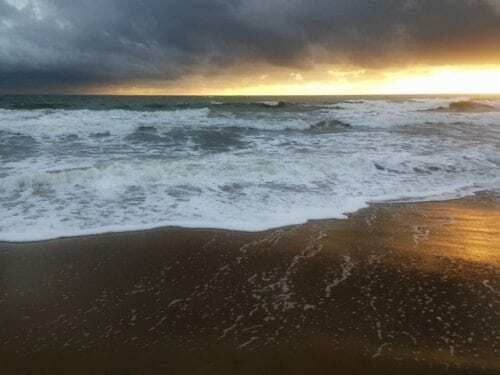 Her story… it could be all of our stories, it could be us weeping for the brokenness that entangles us, but God He makes the way and he reminds us to come and bend near. This was a beautiful reminder of His gentle mercy. I’m so glad you have found value in your visits here, Dawn! I’m so grateful for every person who visits. Writing this, her namelessness hit home. She truly can be all of us. The contrast with the Pharisee challenges me. Thanks for visiting! Ginger what a beautiful way you’ve shared God’s love and forgiveness. And yes we all have a story like this in one way or another. Depending on the day, I change parts between the woman and the Pharisee. I’m grateful that God doesn’t ignore our heart felt cries for mercy, forgiveness, and healing. I’m so glad our paths have crossed today, Debbie. Reflecting on this passage got to me as I was writing it. This really is such a profound story that compels me to dig deeper in so many ways. Thanks for joining me today! Yes, this is something to take time to consider. I have found myself really praying through the issues of the Pharisee as well as the depth of worship in the woman. Thanks so much for sharing today, Dolly. I have been so motivated by your prayer focus for Lent. Choosing life–oh this is such a blessing we often take too lightly! I love the way you put this, Cathy. Thanks for sharing! “Pride makes it hard to love God.” That’s a profound thought. Never really considered pride that way, but I think you are absolutely right. When we can only think of ourselves, there’s no room to love anyone else. Thanks! Loving God is so important, and yet so easily overlooked in the busyness of our days. Pride distorts our vision and certainly affects our relationship with God. I’m sure I’m guilty of this more than I realize. I’m so glad you stopped by today. Have a happy spring! Humility garners God’s pleasure, and Scripture states that pride is one of the things God hates. I didn’t think about that when I was writing, but it certainly relates. Blessings, Friend! Ginger, this is one of my absolute favourite Bible stories. And you retold it beautifully. So many women in the Bible were extremely bold and courageous. They did scandalous things. And they shut the rest of the world out…those who would discourage them. I look forward to meeting these amazing women one day! Thanks for linking up with Grace and Truth. I have chosen your post to be my feature this week. Please stop by my site tomorrow and get the “I was featured” button! Thanks for your kind feedback Aimee! I’m thrilled to be featured on Grace and Truth this week. I’ll be sure to stop by. I love the blogging community you foster with this link up. Thank you so much for featuring this post at Grace and Truth! It is an honor to be selected from so many wonderful posts. Blessings! Ginger- you have so beautifully written this!!! Wow!!! I can so relate to this woman washing the feet of Jesus and have my own story of redemption. I’ve heard this story ever since I was a child but your version is just simply beautiful. I love the way you illustrate how the table turned on Simon. Thank you for sharing such a beautiful story!! Thank you, Shannon. I am grateful you have been able to relate to this woman in a fresh way. I know your story of redemption is just as special as this woman’s. I’m so glad you chose to stop by and share your heart today!